TheGunBlog.ca — The Canadian government’s list of who it consulted on Bill C-71, a proposed law to ban more guns and further restrict lawful hunters and sport shooters, includes people who say they weren’t consulted, as well as the government’s public-relations advisors. Minister of Public Safety Ralph Goodale submitted the list to the House of Commons on June 6 in response to Question 1671 from Larry Miller, an opposition member of parliament. Miller requested details of the government’s “consultation sessions” on April 18. TheGunBlog.ca obtained the Minister’s response through a special request to the Library of Parliament. 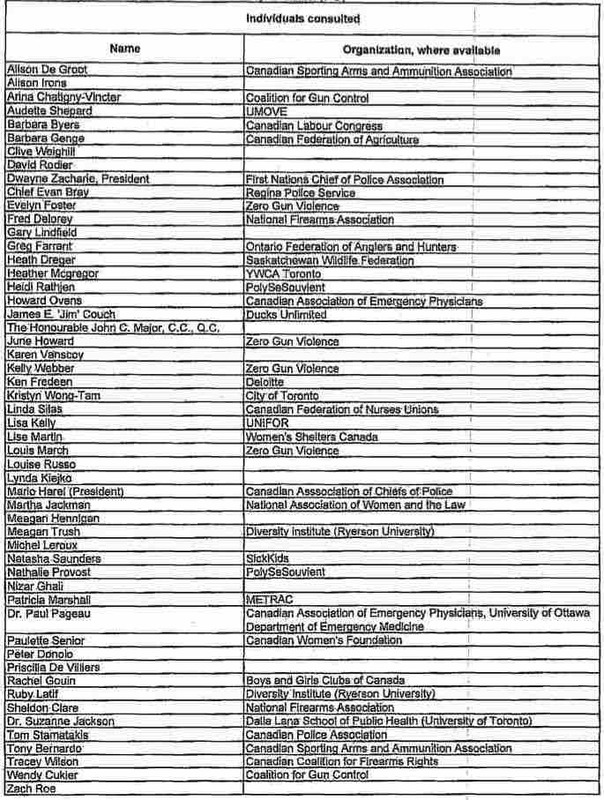 Annex 1 of the minister’s response lists 53 individuals consulted for Bill C-71, including Tony Bernardo, Sheldon Clare, Tracey Wilson and Alison de Groot, senior officials at Canada’s main associations of firearm owners and of the firearm industry. The four executives are among seven people on the list who have told TheGunBlog.ca that they weren’t consulted about the proposed law. 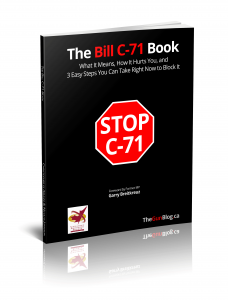 The government of Liberal Prime Minister Justin Trudeau faced criticism from its own members of parliament for insufficient discussion about Bill C-71, even before proposing the draft text to the House of Commons on March 20. The Hill Times newspaper said March 12 that Trudeau verbally “attacked” T.J. Harvey, the chair of the Liberal rural caucus, after Harvey said in a private meeting of MPs that there was a lack of meaningful consultation with them. Harvey has since been replaced as chair. Heather Bear, an official with the Assembly of First Nations, told the House of Commons committee reviewing Bill C-71 that the absence of consultation could lead the assembly to challenge the bill’s constitutional legitimacy. Bill C-71 is aimed at Canada’s 2.1 million federally licensed hunters, farmers, gun collectors, recreational shooters and competitors. If passed, it will expand measures to imprison them unless they get special police permission to buy, sell, own or transport legally owned firearms. It also would prohibit as many as 15,000 lawfully owned rifles with no way of informing most owners, potentially leading to confiscated firearms and jailed individuals. Most of the 53 people listed in the table of “Individuals consulted” seek to expand criminal laws aimed at responsible gun owners. Fewer than a fifth represent law-abiding firearm users, owners or businesses. Alison de Groot, the managing director of the Canadian Sporting Arms and Ammunition Association, the country’s main industry group, is the first person named on the list. She said the group submitted several requests to meet ministry staff about Bill C-71, and asked to speak to the House of Commons review committee. De Groot and Wes Winkel, the CSAAA president, attended the government’s Summit on Gun and Gang Violence on March 7 as members of the audience. Tracey Wilson, who is listed in the table, is in regular contact with parliamentarians and ministry staff as vice president of public relations for the Canadian Coalition for Firearm Rights. She said she wasn’t consulted about the bill. Sheldon Clare, the president of the National Firearms Association, and Fred DeLorey, who advises the organization on communications and PR, are both listed as having been consulted about the planned law. Saskatchewan Wildlife Federation President Heath Dreger is also listed in the table. He said he wasn’t consulted. Darrell Crabbe, the federation’s executive director, Greg Illerbrun, the head of the group’s firearm committee, and two other officials from the federation met Minister Goodale and his special assistant, Mackenzie Hird, on April 18 in Regina for two hours, Crabbe said. They discussed Bill C-71 for about half the time, he said. Another person who was listed also told TheGunBlog.ca they weren’t consulted on the bill, even though they had requested information and sought to give input. They spoke on condition they wouldn’t be identified, to avoid reprisals by the government. Several people listed by the Ministry, including Peter Donolo and David Rodier, didn’t reply to e-mails or phone calls from TheGunBlog.ca seeking comment about their consultations. Donolo and Rodier were listed as individuals without any organizational affiliation. Legally owning a gun requires taking a safety course designed by the Royal Canadian Mounted Police, passing written and practical tests, waiting two months to pass background and reference checks to obtain an RCMP-authorized firearm-licence card, and then passing a daily RCMP background check to be allowed to keep it. All legal gun owners are registered with the federal police, and so are all privately owned handguns and AR-15 rifles. Rodier, also with Hill+Knowlton, is a former lobbyist for the Coalition for Gun Control and a former adviser to Allan Rock, the Liberal Minister of Justice who led the 1995 passage of the Firearms Act. Rodier co-wrote an article in Policy Options magazine in March that concluded “gun control represents an untapped opportunity” for the Trudeau government to win votes in the next election. Other entries in the table of “Individuals consulted” raise further questions about who was or wasn’t consulted. The list names three people from Zero Gun Violence who participated in consultation sessions: Evelyn Foster, Kelly Webber and June Howard. The organization could have been confused with Zero Gun Violence Movement. It should refer to Communities for Zero Violence (CZV) and Evelyn Fox, Kelly Whetter and Joan Howard, Fox said. The Ministry of Public Safety didn’t respond to a request for comment from TheGunBlog.ca about the consultation sessions. As part the process of developing Bill C-71, the government consulted a broad range of groups and individuals, as listed in Annex 1. This list includes members of the Canadian Firearms Advisory Committee (CFAC), which met on March 1 & 2, 2017, and on May 9, 2017, and held a conference call on March 19, 2018. In addition, a National Summit on Guns & Gangs was held in Ottawa on March 7, 2018 with stakeholders and partners from across Canada. Consultations generally happened in person and by phone, and several groups and individuals were consulted on multiple occasions. Consultations were conducted by the Minister of Public Safety and Emergency Preparedness, the Parliamentary Secretary to the Minister of Public Safety and Emergency Preparedness, and/or ministerial staff. The Minister sought the input of a broad range of groups and individuals with diverse experiences, backgrounds, and perspectives. Discussions were focused on the government's commitments related to firearms. Update 1: 11 June, 00:40 Toronto time: Adds comment from Communities for Zero Violence. Update 2: 11 June, 13:15 Toronto time: Adds comment from CSAAA. Update 3: 12 June, 00:30 Toronto time: Adds comment from NFA.